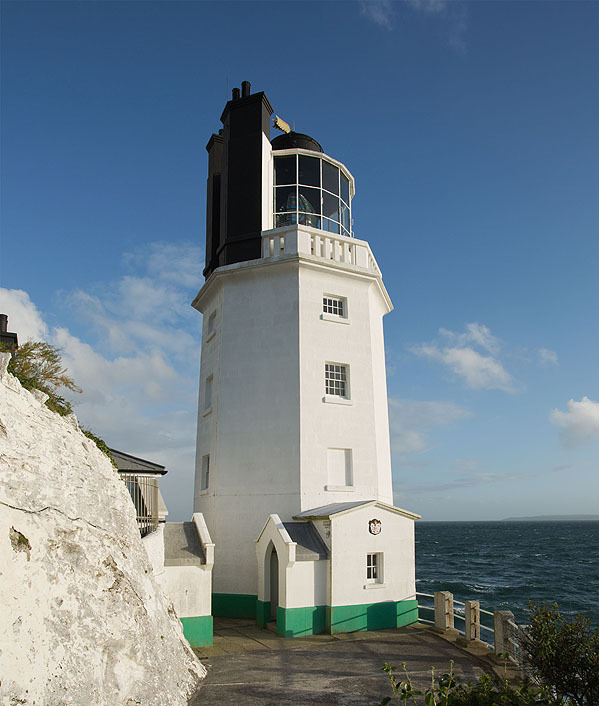 The Lighthouse was built by Trinity House in 1835 . The White light has a range of 16 n.miles , the Red 14 n.miles . The Fog Signal sounds every 30 secs. St Anthony Lighthouse is situated at the eastern entrance to Falmouth Harbour - guiding vessels clear of the Manacles rocks, to the south. The Manacles is a scattered group of treacherous sub or semi-submerged Rocks , south of Porthoustock.. Including Morah (500m off Porthoustock Point), Shark's Skin (just off Manacle Point) , Maen Garrick (600m off Manacle Point) ,Gwinges (1km off Leggan Point), Mistrel,Varses,Carn-Du (the only rock visible at all tides) (1km off Dean Point), Maen Land (300m southeast of Dean Point).